Yesterday, former Atlanta Braves star and beloved-by-the-internet old dude Dale Murphy decided to celebrate President's Day by showing his Twitter followers a picture of one of his prized pieces of memorabilia: a baseball with Richard Nixon's autograph on it. 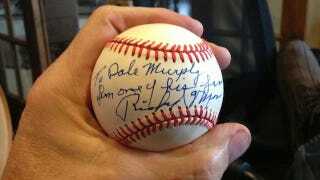 The autograph reads, "To Dale Murphy, from one of his fans-Richard Nixon." Two things: Richard Nixon's handwriting was kind of terrible, and that autograph is bland and impersonal and uninspiring in a perfectly Nixonian kind of way. I like to imagine that Nixon spent a good five minutes coming up with that message, settling on it after also considering, "To Dale Murphy, swing that bat-Richard Nixon" and "To Dale Murphy, from a human man-Richard Nixon."